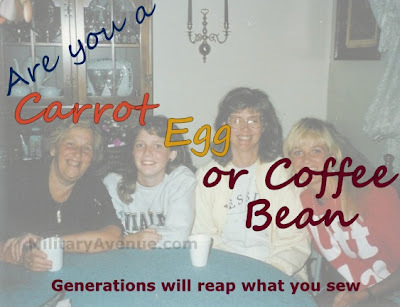 The Military-Family: Carrot, Egg or Coffee Bean? I knew there was a reason I loved coffee. Leanne is an Army Spouse, Air Force Brat and mother of four boys. She PCSed more times in her childhood then can be counted on two hands and has raised her own strong resilient boys while 'Hubs', their dad, served and continues to serve in the Ohio Army National Guard. A strong faith in Christ and a glass of wine every night helps keep her sane. I love this! Thank you for sharing this story!!! I wish I was the bean but I think I'm more like egg. I like it that life does not define us by just moments in a day. I understand Kate... and remember the hard shell I would wear upon leaving or arriving on a PCS. I would like to think we made egg salad with the kids and drank lattes after! PCS's can spice up things! Just thinking coffee cake is good too! Oh my, I digress! We all get in hot water don't we! It is what we make of it, and the help we have from spouses, children and friends that gets us out!